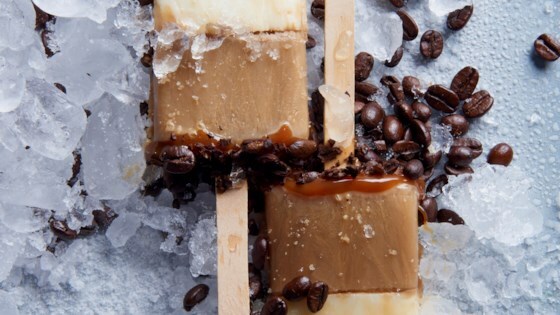 "A layered ice pop with cold-brew coffee, caramel, and milk make for a refreshing treat." Milk Layer: Whisk together milk, sweetened condensed milk, and vanilla in a large measuring cup with a spout until well combined. Pour into 6 (3-ounce) ice pop molds, dividing evenly. Freeze until firm but not frozen, about 2 hours. Insert sticks. Set a timer and check early. If they freeze all the way, your stick won't go in and your layers may separate. Coffee Layer: Whisk together coffee concentrate, milk, and sweetened condensed milk in a large measuring cup with a spout until well combined. Pour into molds over milk layer, dividing evenly. Freeze until firm but not frozen, about 2 hours. Caramel Layer: Spoon 1 tablespoon caramel sauce over coffee layer in each mold. Sprinkle each with 1 teaspoon espresso beans. Freeze until solid, at least 8 hours and up to 2 weeks.